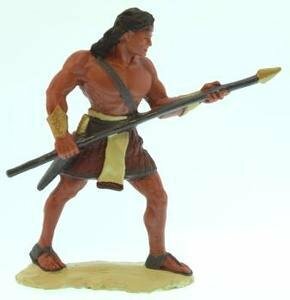 3" Stripling Warrior made out of durable vinyl. Stripling Warrior The 2,000 Stripling Warriors "...were exceedingly valiant for courage... Yea, they were men of truth and soberness, for they had been taught [in their youth by their mothers] to keep the commandments of God". The Book of Mormon tells us how after battle, Helaman fearfully counted his stripling sons. Although all were wounded, to his astonishment there was "not one soul of them who did perish...". Ages 4 and up.